Our concrete forming system utilizes horizontal form plywood, vertical tie bar, and Quick-Strip ties. Click for a 3-dimensional view of a typical set-up. Pre-oiled form panel rentals are estimated at $2.10 per ft2, based on the outside wall surface area. Non-oiled form panel rentals are estimated at $1.75 per ft2, based on the outside wall surface area. These estimates are based on walls less than 6 feet tall. Delivery and/or pick-up is available for an additional fee. A $100 charge is required to have us develop a custom form plan, or you can provide a complete list of required materials. If you rent forms from us, the $100 form plan charge will be waived on the final invoice. For further details on our forming system, please click here or contact us. Forms are supplied pre-oiled by Sharecost. Requires a longer lead time (7-10 days). Forms are supplied without oil. Customer must oil forms on site prior to pour using form oil purchased from Sharecost. Requires shorter lead time (2-4 days). Tie bar is available in a variety of lengths to suit all types of forming projects. Tie bar is supplied to you in bundles of ten (10) pieces. If you return the bar re-bundled, we apply a 25% discount to the final invoice. * Above pricing lists the rental price for renting tie bar only. 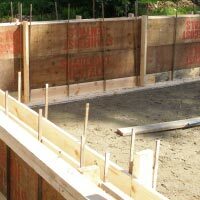 For an estimate on a complete foundation plan, please see Foundation Form System above. Form stakes are 24” long and come pre-drilled for use with duplex nails. Our 24” × 3/4” form stakes are used in combination with duplex nails to set the height of low to the ground forming jobs, like slabs, sidewalks, and curbs. If you would rather own form stakes, we sell them as well. Please call for current rates. The Jahn “A” Brackets can be utilized to hold a single horizontal wale or a single vertical stud with any type of wall form; round, curved, battered, beam and/or columns. This bracket can be installed before or after the wales have been positioned. The slots in the bracket allow it to slip over the snap tie end without laborious threading through holes. When properly installed, the A-81 bracket will not loosen from internal vibration of the concrete. Pressure from the bracket is against the 2 × 4 instead of the plywood. Used with 4-3/4” (short-end) snap ties, is easy to install and strip, requires no nailing and is very fast. Note: Sharecost’s rental forming system does NOT use Jahn Brackets – it uses tie bar and Quick Strip ties. Rates are PER bracket. Brackets returned in tied-off "necklaces" of EXACTLY 25 pieces per loop will receive a 50% DISCOUNT to the above rental rates. We also stock rebar in our concrete supplies department. Uniquely designed and motorized for to save labour, the electric VB16Y is used for both cutting and bending in one unit. Precision angle bends are preset and completed in a few seconds. Light-weight and compact. This portable, manual rebar cutter/bender with accept rebar up to 5/8” in diameter. We also stock a variety of surface retardants in our concrete supplies department. Pump-action sprayer for construction materials. Has a 5-foot long lead and 3.5g (13.2l) capacity. Heavy-duty “Extreme” version also available for use with harsh chemicals. High-strength snap tie wedge designed to slip over the head of standard or heavy duty snap ties to provide ample bearing area for proper load distribution into the wales. Note: Sharecost’s rental forming system does NOT use Snap Tie Wedges – it uses tie bar and Quick Strip ties.